I was expecting the XML libraries to be quite chunky, but on my Netduino Plus 2 there wasn’t a huge size difference, the StringBuilder download was 49K8 bytes and the XMLWiter download was 56K1 bytes. When I ran the StringBuilder and XMLWriter versions they both had roughly 92K6 bytes of free memory. 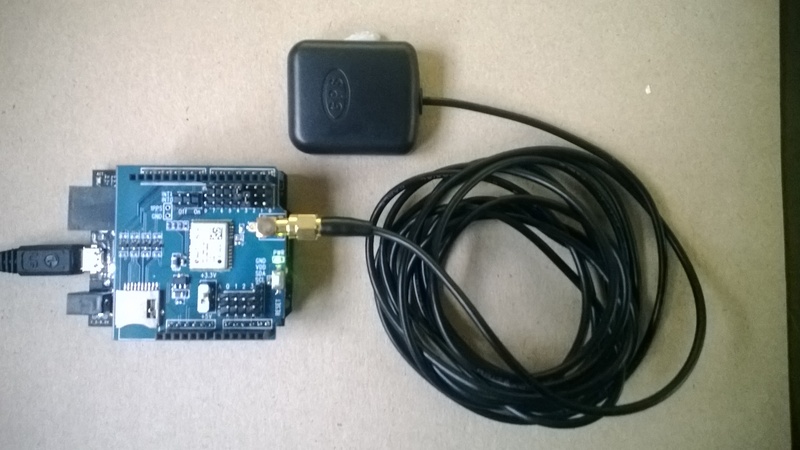 For one of the code club projects we looked at the National Marine Electronics Association (NMEA) 0183 output of my iteadStudio GPS Shield + Active Antenna. We used the NetMF Toolbox NMEA GPS processing code with a couple of modifications detailed here. The XML was constructed using a stringbuilder (NetMF 4.2) as this appeared easier/smaller than using the baked in XML functionality. I use the SeeedStudio Grove system for prototyping and teaching. One of the modules is a Global Positioning System (GPS) unit based on the u-blox 5 engine. To get this unit to work you just plug it into the UART socket on the base shield and load the necessary software onto an Arduino (or compatible) board. My day job is working on Microsoft .Net applications so I use a Netduino Plus or a Netduino plus 2. The Seeedstudio 4 wire connector system has some advantages but for a couple of projects I was looking at I needed to be able to run on a different serial port and access the one pulse per second output. I had a look at several other vendors and the iteadstudio GPS Shield + Active Antenna which is based on the u-blox 6 engine looked like a reasonable alternative. 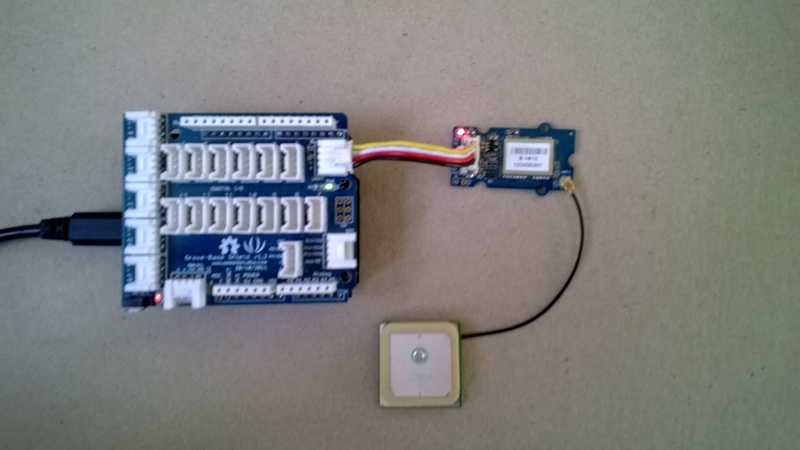 After some testing I found that the Iteadstudio GPS shield appears to have a shorter time to first fix after a power cycle, I averaged 10 sets of readings for each device and found that in my backyard it took on average 46sec for the Iteadstudio shield and 55sec for the SeeedStudio device. Both devices output National Marine Electronics Association (NMEA) 0183 sentences and I use the NetMF Toolbox NMEA code to process the data streams. I have modified the NetMF toolbox code with an additional event handler which empties the serial input buffer if there is an error and one of the validation checks needed to be tweaked as it was possible to get an exception due to an empty string. // Have we received a full line of data? With these modifications my Netduino Plus 2 can runs for days at a time without buffer overflows or other issues, you just need to be careful to make your event handlers block for as little time as possible. I have been looking at building an NetMF NMEA driver which runs on a background thread and doesn’t use any string manipulation methods e.g. string.splt so the garbage collector has less to do, but this will be a topic for a future post. A few months ago I built a proof of concept NetMF 4.2 application for a client which uploaded data to a Windows Azure Service. Recently we had been talking about extending the application to include support for tagging of the uploaded data with position information. 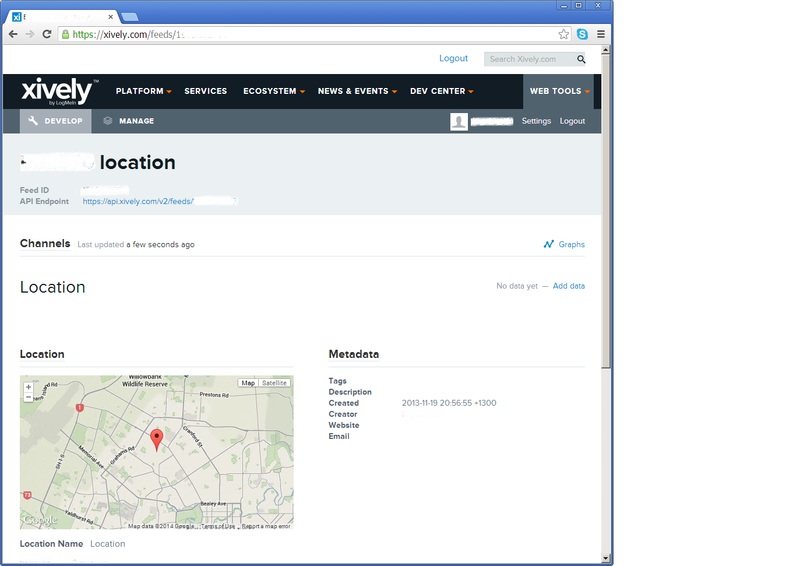 I purchased a Gadgeeter GPS Module from SeeedStudio and did a trial integration of the module into the client’s application. Initially it was working but I noticed that after a while (I monitored the application using MF Deploy) it would start displaying buffer overflow messages. I did the usual thing and went looking for “slow” code in the GPS events, removed debug print statements and made sure my application and the GPS were “playing nice” but the problem persisted. Assembly: mscorlib (4.2.0.0) Assembly: Microsoft.SPOT.Native (4.2.0.0) Assembly: Microsoft.SPOT.Security.PKCS11 (4.2.0.0) Assembly: System.Security (4.2.0.0) Loading Deployment Assemblies. Assembly: Microsoft.SPOT.IO (4.2.0.0) Attaching deployed file. Assembly: GTM.Seeed.GPS (1.6.0.0) Attaching deployed file. Assembly: Microsoft.SPOT.Graphics (4.2.0.0) Attaching deployed file. Assembly: Microsoft.SPOT.Hardware (4.2.0.0) Attaching deployed file. Assembly: Microsoft.SPOT.Hardware.PWM (4.2.0.1) Attaching deployed file. Assembly: GHI.Premium.Hardware (4.2.9.0) Attaching deployed file. Assembly: System (4.2.0.0) Attaching deployed file. Assembly: Gadgeteer.Serial (2.42.0.0) Attaching deployed file. Assembly: Microsoft.SPOT.TinyCore (4.2.0.0) Attaching deployed file. Assembly: GHI.Premium.System (4.2.9.0) Attaching deployed file. Assembly: GPSTestApp (1.0.0.0) Attaching deployed file. Assembly: Microsoft.SPOT.Net (4.2.0.0) Attaching deployed file. Assembly: System.IO (4.2.0.0) Attaching deployed file. Assembly: GHI.Premium.IO (4.2.9.0) Attaching deployed file. Assembly: Gadgeteer (2.42.0.0) Attaching deployed file. Assembly: Microsoft.SPOT.Hardware.SerialPort (4.2.0.0) Attaching deployed file.